Another quick mountain while in Southern France. I had seen this mountain pretty much every time I stood in front of the house we rented and also each time we drove away from the house. The highpoint was only clearly visible because an antenna supposedly at the highest point gave away its location, because otherwise the formation consisted of a 20-30km long rib rather than on distinct highpoint. From the topo map I learned that the highest point was called Mourre Negre, and that a forest road as well as several hiking trails led to the top. I had done some reconnaissance a couple days before on how to get to the trailhead and had therefore little trouble in driving the 15 miles from the house to the beginning of the forest road which I had wanted to use. I set out running at about 7:30 in the morning. I was running because I had promised Catherine to be back home by 10am. The closer I got to the trailhead the more I regretted having given that committment to help Catherine with the kids, because while from far away the summit looked fairly low and certainly no more than maybe 30 minutes of hiking away, I realized, once closer, that that assumption was overly optimistic. It happens to me pretty much every time that I am overconfident in my abilities or underestimate distances and heights in the mountains (or both). In any case, I thought that by running part of the forest road, I would get to the summit and back not too late after 10am. I further thought that the forest road would be flatter and thus easier for running than the hiking trail. It turned out that I was right on that last assumption, because I never stopped running until I got to the summit about 70 minutes after setting out. The forest road led in switchbacks passed some half ruined structures up to a pass, about 1km west from the summit. I jogged up the switcheback and got to the pass just in time, because I was about to give up (running), but once at the pass, the remaining km to the summit was flatter and easily covered in about 10 minutes. Not bad for a morning's work, 700 meters of elevation and about 6kms of running in an hour. However, when I got to the summit, I was pooped. I had to sit down and rest for a few minutes before touring the summit area, which mainly consisted of a gigantic antenna that I had already seen many times from the distance over the previous week. I found one other hiker and a few mountain bikers and asked them to take my summit pictures. 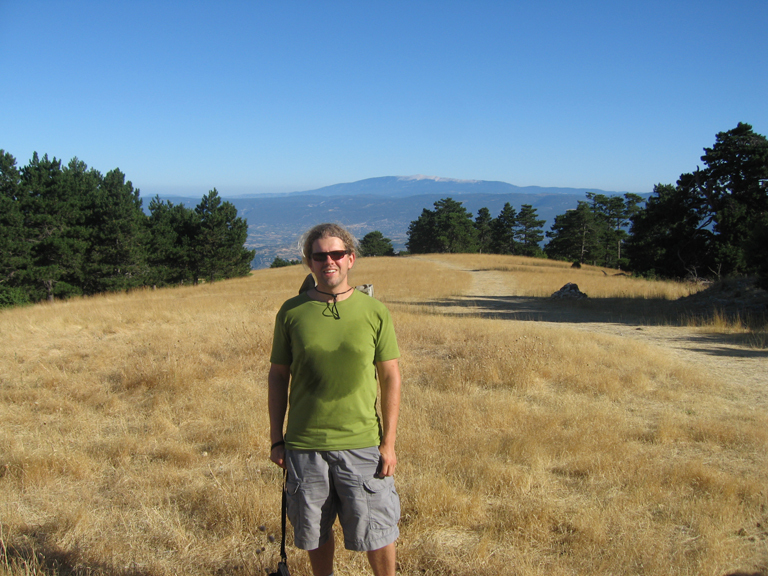 Turns out that it was a nice shot because the Mont Ventoux was in the background. After 15 minutes on the summit I returned to the pass and the jogged all the way down the mountain until I arrived at the car 30minutes later. I felt great. No feet or knees were hurting, not even an hour later when the endorphines had disappeared. All in all a great outing and a nice preparation for our bike ride up to Ventoux two days later.